We as human beings face fear, anger, pain and suffering. These are 3rd dimensional ego based emotions and are not heart based; hence must be released and transmuted. Energy cannot be made, created nor can it be destroyed. It can however be transmuted. Transmutation is a process of changing fearful thoughts and feelings into a loving vibration. It is like alchemy where base metals are turned into gold. Transmutation raises your vibrations and raises the soul to a state of unity with divine. How do we transmute the lower vibrations? There could be many ways to do this as eventually it is all energy. However, below are stated a few ways in which you can transmute energy. I would suggest you use the best technique which resonates with you. The Violet Flame is a divine healing as well as transmutation tool given to us by Ascended Master Saint Germain. It is a sacred flame of transmutation that exists only on the Higher Dimensions. Some call Violet Flame as the Spiritual Alchemy in action. Just as Alchemy is said to turn Lead into Gold, the ultimate purpose of the Violet Flame is to turn the Human into the real crude divine human form. The history of violet flame goes back to the era of Atlantis. The high priests of Atlantis used the violet flame as a healing and transmutation tool. However, later fearing its misuse, it was withdrawn by the great masters. It was again brought to planet earth in the 20thcentury in the 1980s. Since then the violet flame wave has been spreading all over the planet by the light workers. One can be attuned to the energy of the violet flame by a master. When you pass the level of violet flame, raise your vibrations and ascend yourself, you become eligible yourself for the silver violet flame. Just like violet flame, the silver violet flame needs a master to attune you after which you yourself can attune others. However, with the Gold violet flame and the Diamond violet flame energies auto attune you when you are ready. You can consult a violet flame master to get yourself connected or attuned to the energies. Also, there is a lot of material available online by Elizabeth Clair Prophet, Diana Cooper and many more spiritual authors. Read it and if you feel the calling, seek a master to learn it. Fire is known to transmute the lower vibrations and raise the frequency. Fire can really burn away debris of dark struck energy and replace them with beautiful positive force. Ancient religions of the east have been worshipping fire as a source of cleaning and transmutation. When we cook food on the flame, the same principle follows, doesn’t it? We put all the raw ingredients in the cooking utensils or on a raw flame and they come out as cooked and in an edible form. Even when we sterilise the utensils or medical devices by putting them in boiling water, it is the energy of the fire that transmutes the impurities in it.Young children and infants are many times given ‘boiled’ water. It is actually a process of transmutation itself. Fire both in its physical and spiritual form can help us burn unwanted stuff to get rid of it. In case you are facing any fears, troubles or worries, you can write them on piece of paper and set them on fire. This works like anything. Dragons are higher dimensional beings who are said to be very powerful. They are pivotal to transmute dense lower vibrational energy. Many religions of the east give special importance to Dragons and worship them. The Elemental Dragons as the name suggests represent the 4 elements and are said to be 4th Dimensional beings who help you transmute dense dark heavy energy. They can be specifically invoked for clearing the negativity. Reiki symbols can act as major transmutation instruments. Remember intention is everything. Usui Reiki symbols like Dai Ko Myo and Cho Ku Rei, can help you transmute lower energies. In addition to that, if you are a Karuna Reiki practitioner, you can use the Rama symbol. The Karuna Reiki symbol Rama can help burn lower negative energies. Rama works in specific capacity to burn negative energy specifically in the lower chakras. Tune in Rama for 21 days at a stretch to clean yourself completely of negative energy. Just keep on giving Rama symbol to yourself and take a salt water bath and a gargle regularly. You will feel lighter. Ask Rama symbol to replace negative energy with positive each time you do it. Crystals like Black Tourmaline, Smoky Quartz and Amethyst are known as transmuting agents. You may spend minimum 15 minutes daily with the crystals to help them clean your aura and transmute the negative energies. Seek help from a crystal expert on their usage. Remember to cleanse the crystals with water or candle light or by burying them in mother earth or by incense smoke each time before using them. Nature has a big share in transmutation. It could be surprising, but Mother Nature has her own solution to every problem. Herbs and flowers like lavender, rosemary, orchids, sage and cloves act as big healing and transmutation agents. They can be either used as herbs or flowers or burnt or used as essential oils. My favourite and the best and easiest way to transmute energies. We can primarily seek assistance from 2 archangels: Archangel Zadkiel and Archangel Michael. Simply light a candle and ask the angels to transmute anything that doesn’t serve you. Sit in a comfortable position either sitting or lying down. Call upon your higher self and guides. You can burn a violet candle or a violet teal light. Violet is the colour of transmutation. Now invoke the presence of Archangel Zadkiel and Archangel Michael. Ask them to help you transmute all that doesn’t serve you. Imagine you putting all the dark areas in your aura in a box and handling that box to Angels. Now ask them to fill your aura up with their light. One of the most effective way to transmute dark energies is to rub rock salt in your aura or even better take a rock salt water bath. You can add the Reiki symbols to the bathtub. 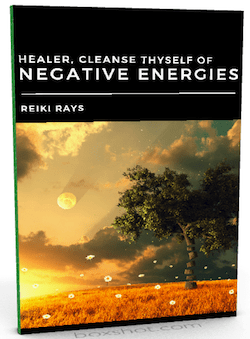 This is an instant way to transmute the negative energies. Finally, know that intention is everything. Although the above mentioned list acts as a guide, there may be more methods to transmute. Do whatever suits you the best. Keep your vibration high. In case you are bogged down by lower vibrations, immediately detach yourself and ask the energies to help you stay aloof. Wishing you all the luck and love as you raise your vibrations. Ashwini Chubé heard her “calling” and was drawn to Reiki amidst her routine job in a Mumbai based investment bank. She says her life has become Reiki after being attuned to it. She takes the help of Reiki for almost everything from little things to huge problems and everytime she does that her faith increases. Ashwini likes to write, cook, read, travel, dance in her spare time. She loves nature walks too. She is USUI Reiki Master Teacher, Practitioner of Karuna Reiki, Soulmate Reiki, a practitioner of Violet Flame, Silver Violet flame healing and Angelic healing. She is also a reader of Angel Oracle cards, Angel Tarot cards and she is a hypnotherapist. Ashwini conducts Angel mediation workshops in Mumbai, India. Reach Ashwini at Urjahealers@gmail.com and on Facebook at Urja – Holistic Energy Group (https://www.facebook.com/pages/Urja-Holistic-Energy-Group/656771061097789).